What Is a Yorkshire Terrier's Diet? 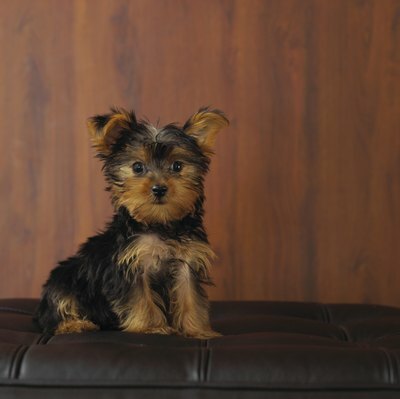 Yorkies are small in stature, but not personality. Anyone who has spent time with Yorkshire terriers knows they are intelligent dogs with often bold (some might call mischievous) personalities. Although they don't require excessive exercise, they are often high-energy dogs. What shall we feed our little bundles of energy? The answer has many ingredients, so to speak. Meat should form the base of your Yorkie's diet, with veggies, oils and starches filling in the rest. This doesn't mean shepherd's pie or bangers and mash, but it can mean catering to your Yorkie's country of origin. As you may have guessed, that's England. All dogs came from a specific corner of the globe. In olden times, they ate foods local to their area. Modern dog parents can use that information to provide historically accurate foods. Across the pond, lamb was likely a main meat staple for the Yorkie. If yours has not eaten fresh lamb before, it is best to offer only tiny, lean amounts at first, to monitor your pup's reaction and allow her body to adjust. A general rule is to add 10 to 25 percent of any new food per week. As with any change in your dog's life, it is best to consult your vet first. Vegetables are a necessary component in your dog's diet. Wild dog ancestors ate their entire prey -- not just the meat, but the partially digested vegetable matter that remained inside. Your sophisticated Yorkie may turn up her nose at this concept, but she still needs to eat her veggies. Regional foods for the Yorkshire terrier include beets and potatoes. As with meat and any other new food, start only with tiny, cooked amounts. What Else Should I Feed My Yorkie? The regional foods mentioned here are great additions to your little one's diet. However, it is important to ensure she has a wide range of foods to help maintain nutritional balance. What Fruits Are Healthy for Yorkies?